I'm starting this topic because my forum isn't growing and my other thread would not be an appropriate place for discussing about Shaw's Nightmare. So you can ask about anything, any general play questions here. There is a wiki which could really use some help. Reminds me "Ken's Labyrinth". But you should work more on art. It looks very noobish simple. For those who are interested you can read the new history page. 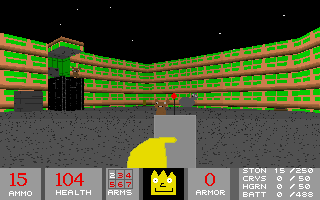 I haven't played through a lot of the game, but there are some Chex Quest references in level design, right? I also wonder if the somewhat sluggish movement of the main character, and noticeable inertia, were added to convey the feeling that you're in a dream? As for the art, I believe that the design actually makes a good base for a unique setting, that of a boy's dreams. It would be interesting to know how a skilled pixel artist would interpret this theme based on the existing art in the game. BTW, recently I found this interesting website of a talented pixel artist who is also happy to give advice and share the tricks of the trade. Maybe you should try contacting him? He seems to give individual advice to people, like here or here. The section is called "Fix my sprite", and you could probably send him the existing sprites and ask how those could be polished in his opinion. I should confess that what I really did not like about the art is that the game is actually bloody. I did not expect that from a game with this theme, even though it's very much inspired by Doom. I'm also curious, why did you pick the Build engine in the first place? It would probably be a lot easier to just use a Doom source port for DOS, like MBF. It's not that I'm suggesting that you migrate to another engine, now that you have a functional build of Build (no pun intended) for your game. On another note, the fourth and the fifth screenshots are identical. I think E1M2 is probably the only reference. BTW how far have you reached in Shaw's Nightmare? Yes but most people don't like it. If there's one thing I've realized, it's that I can't do art. But nobody wants to collaborate with me.... First of all Shaw's Nightmare II has only 20 levels done by this point. I have very little for time for art as it is. It would be better if I got an pixel artist. I didn't realize they existed at that point. And DJGPP is a pain to use at times. At that point I didn't even know C (only Turbo Pascal). I think I got to around level 5 of the first episode, and checked a couple of other episodes but didn't play very far. I've just tried it, the controls seem better, but there are still delays. While it does help create the effect of being in dream (kind of), it may sometimes interfere with playing, especially when you need to manoeuvre on ledges or in combat. You should really drop all this negativity towards your very own project. How much negative criticism have you actually received? From what I know, people were mostly just not interested, and that can be changed by using a different presentation strategy. I think free textures would be the easiest to come by. OpenGameArt.org alone has a large texture gallery (just check the licenses to make sure you can use them). For monster sprites, have you considered digitising toys/action figures? This is not an easy method but it's certainly less demanding than creating sprites from scratch. Another approach would be clay models, like in Harmony, although this is indeed more work. If nothing else, you can use assets from Freedoom and Blashphemer as placeholders. In fact, I believe that at least Freedoom art is licensed in such a way that allows further modification and creation of derivative works, so you can use the sprites/textures as basis for your own art. I would suggest that whatever course of action you take, publish a short demo of Shaw's Nightmare II here and ask for feedback. That will help increase interest and actually involve people in the development of the game. Also, it seems a good idea to me to create a list of features that make Shaw's Nightmare and Shaw's Nightmare II unique, and also of unique/new features that could be added to the game. For example, being a Build engine game, Shaw's Nightmare has sloped floors and mirrors, which are not found in Doom. However, I'm not sure if these features are used to actually create unique level design solutions or gameplay situations that would be impossible in Doom. The features are listed in the FAQ. Shaw's Nightmare also has the ability to make slopes on the fly, a feature that hasn't been seen in other Build games. I don't think much features can be added except for extra tags in the trigger system. This is basically what Doom II added compared to the original Doom. While I'm generally all for Doom clones, I believe that any game should have its own unique features, even if it follows the footsteps of a well respected pioneer in the genre. Take, for example, Quiver, a pretty obscure FPS game. While it has very similar visuals it is actually far from being a straightforward Doom clone. The weapons and monsters work completely different to Doom. For example, one of the weapons will draw the player's health down slowly when used. The level design is pretty different as well. Here's a YouTube gameplay video. Also don't forget that by using the Build engine, you have placed Shaw's Nightmare in the family of quite diverse games that are full of features that make each of them stand out. You can also draw inspiration from other games, such as Rise of the Triad, In Pursuit of Greed or Eradicator, all of which have some interesting powerups (and enemy types). In addition to the above, Shadow Warrior and Blood have alternate fire modes for some weapons. For some interesting read on FPS weapons in general, here's an interesting TV Tropes article: Standard FPS Guns. I suppose you could consider adding some features similar to the above, or maybe some other concepts of your own. In my opinion, the theme of dreams and nightmares has not yet been fully explored in video games, so you could experiment with something no one attempted before. From our discussion, I'm still not sure if you yourself are content with the art style of your game. If you're considering art change or upgrade, I think another option of using third party assets would be to take stuff from Ken Silverman's Build test game. The license seems to allow non-commercial distribution of derivative works (and I guess you can clarify that with Ken himself). On the general development of Shaw's Nightmare II: I believe that you need to analyse why the first game did not achieve much popularity, and fix that in the sequel. If the second game remains essentially a map pack/addon to Shaw's Nightmare, it will probably not become more popular than the original. Malvineous from the RGB Classic Games Forums gave you quite detailed feedback a while ago. There are also valid points of criticism in this review. Perhaps you would release a demo of the second game, one or two levels long, to get feedback and determine the direction where you need/want to be heading? It also seems a good idea to write a roadmap, which will also help you to define areas where you need assistance from other people, and request it accordingly. Well the story goes that Shaw unwittingly goes to a experimental machine at a science fair and he must once again face his nightmares. For the longest time, I am content with the art style, I was mainly looking for level designers. In fact I was more likely to get a level designer than an artist. One thing I've noticed is that people seem to hype Shaw's Nightmare II more than the original Shaw's Nightmare. Compare the popularity of this and this. It also seems a good idea to write a roadmap, which will also help you to define areas where you need assistance from other people, and request it accordingly. Pardon me, but how can I create a roadmap? I checked out your website/forum its actually nicely made buddy. I will join it for the heck of it. I must say its quite tough to build a forum with interesting members. I have a Turok forum and though its hard to find real interest from here, if you seek the right ppl you can do it. I was close to giving up but out of no where I met the right person(on steam) and now there is over 1k posts and 70 members in 5 months. All you really need is a partner that has as much interest in such as you then you can work together Need to search youtube and steam also.. This is not what I meant. Real dreams often resemble reality but have weird, illogical elements, such as rapid change of setting/screnery, objects and people transforming into something else etc. This could be used as basis for some in-game effects, some of which might have not been found before in video games. Well, since some people have expressed criticism of the art style, perhaps you would consider using some free third-party assets? That could increase the general appeal of the project and widen the audience. Ken Silverman's Build demo game has some really nice textures. Also, what do you think about digitising toys for monsters and/or toy guns for weapons? Even if you have no equipment to do that yourself I guess there are more chances to convince someone to do the digitising for you than to create art from scratch. On a different note, I have noticed that in v1.66, in the first demo there's a noticeable lag when the player character jumps from the ledge into the large hall (right after the demo starts). I'm running the game in DOSBox set to 30,000 cycles (dynamic core), in the default 320x200 VGA mode. Both Ken's Build demo and Duke Nukem 3D run at 320x200 with the same DOSBox settings a lot faster and smoother. A roadmap is a document that details the development process, sets short- and long-term goals of development, and outlines required resources. According to these pages, Shaw's Nightmare ranks 3,066 of 28,704 with 2,166 visits of the game page, and Shaw's Nightmare II ranks 1,955 of 28,704 with only 693 visits. Or did you mean something else? Download the Shaw's Nightmare II demo here. What environment are you running it in? Darn, its DOS based. I don't mess with that anymore. The game runs well in DOSBox. You just need to get DOS4GW.EXE for the demo (included in Shaw's Nightmare and available elsewhere on the net). There's inertia not only while moving, but also while turning. Would you consider reverting back to smoother player controls, as in other Build games? It's sometimes hard to manoeuvre the character in the areas. Another thing is that generally gameplay feels very slow compared to both Doom and Build engine games. This concerns the way the player moves, the speed of the weapons and enemies. I'm certain a faster-paced gameplay would be much appreciated by players, and would also be more in line with how the actual games you're paying tribute to with your project actually play. BTW, perhaps you would consider open-sourcing your game? I have also checked the Windows version of Shaw's Nightmare, it plays smoother than the DOS one (which might suggest that the delays mentioned above might be related to something in the DOS code), but there's still this inertia while turning. It almost feels like you're not controlling a person but some huge, heavy and bulky object. Try a much higher number of cycles. The game runs quite smoothly on QEMU, which I use to develop the game. I tested the game on ykhwong's DOSBox and it ran smoothly with 100% cycles. Have you tried the game on a real machine? No, but if you want it you can contact me and I will send it to you. Like I said try increasing the number of cycles in DOSBox. BTW, try to make posts in the Shaw's Nightmare forum so that it feels alive. This is why I suggested open sourcing the game, so that maybe people experienced in coding (e.g. from this community) could perhaps help you improve the code. The problem is, Shaw's Nightmare lags when run with the same DOSBox settings that yield much faster performance for Duke Nukem 3D, Ken Silverman's Build engine demo and other Build games (all run in default 320x200 resolution). Again, perhaps if you ask the coders here who are experienced with the Build engine to review your code, then this could be improved? Also please don't forget that DOSBox speed with 100% cycles is a relative value that depends on real hardware that is used to run DOSBox. For a real DOS machine, maybe you could ask some people at VOGONS forums to test the game for you. Actually I made a post there but it never showed up. It seems that you have set the forums to pre-moderate new users' posts (so that they are only displayed after a mod/admin approves them). Also here is a much wider audience, and generally more people who are interested in your game. To my mind, it's much easier to rely on an existing user base to promote/develop/improve your game, rather than spend effort to create a community from scratch. I suppose but who is experienced with coding with the Build Engine here? Really? That is strange as I have neither been notified of any new posts nor can I see any new ones. Maybe you can try again. Well, the people who work on EDuke32 of course! BTW, do you know about this EDuke32 mod? Even if it is not compatible with the old DOS EDuke builds, I guess similar features could be added to the EDuke DOS source code? Migrating to the EDuke codebase would probably increase compatibility with existing Duke maps I suppose. I was able to post now, but cannot delete the test post I made. Would you mind deleting it? That will require me to rewrite the whole game. I can't just drape Duke codebase over the existing engine and it will break compatibility with the old maps. I wrote the game from scratch because the Duke3D code is... can I say mangled. I did this for stability and development time increase. I wrote the game from scratch because the Duke3D code is... can I say mangled. I did this for stability and development time increase. Well then, I hope people here will help you with advice and maybe check out your code (if you permit them). I believe that your game would benefit if it got faster paced gameplay (and optimized DOS performance). What do you think should be the next poll? What is your preferred skill level? While playing with Ken's Build demo I suddenly had another idea. Have you considered using voxel models for monsters instead of sprites? Voxelstein 3D did some great job with voxel enemies, but I think that if you convert Shaw's Nightmare monsters to voxels the results might actually get quite good! I just tried the game at 30,000 cycles w/ dynamic core. It ran at an acceptable speed. It only lags when there are a lot of sprites on the screen. It's still slower that other Build engine games running with the same settings. Even if the speed issues are not 100% related to performance in DOS/DOSBox, the pace of gameplay is quite slow. Just compare it to Doom, there's a significant difference in speed. Apart from the speed of gameplay, the level design could definitely be improved. The demo level you've shown is pretty straightforward and does not encourage (or allow for) much exploration. I've also had issues with the first game where there are pits the player can fall into but there are no means to get out of them (e.g. level one, or the starting area of the Arcade level). Apparently the most frequent visitors to the game website are from Tunisia and they seem to come from the Classic DOS games download page. On that note, that page should be updated to include v1.66. It has been out six months now. the Classic DOS games download page. On that note, that page should be updated to include v1.66. It has been out six months now. If you mean the DOS Games Archive, I'm not really involved with that site anymore. You could ask Jorrit to upload the new version though.